Create a selfie poem on your first day back at school using PowerPoint, a selfie stick and a camera! There's no doubt about it - kids love selfies! It seems that we live in a selfie culture! Most kids use selfies as a way of communicating with their friends and celebrating a moment. In the report Teens, technology and friendships the writers point out that social media and selfies are a natural draw for tweens and teens in our photo-orientated culture. Last term, I explored the idea the idea of letting one of the classes I teach create selfie poems in class. Armed with a poem structure, a selfie stick and my cell phone, I suggested the idea to a Grade 6 class. It was received with great enthusiasm. To get started I created an optional poem outline for those who wanted to use it and even use only bits of it. Some students don't need an outline - they can just write great poetry. Others need a structure. Here is the three-stanza poem outline that I used. I tried to encourage the class to let every two lines of their poem rhyme if possible. d) to give the poem an online link so as to share it with others or embed it in the learner's classroom blog. This activity would make a great beginning of the year lesson for a class as a creative way of getting the learners to introduce themselves. 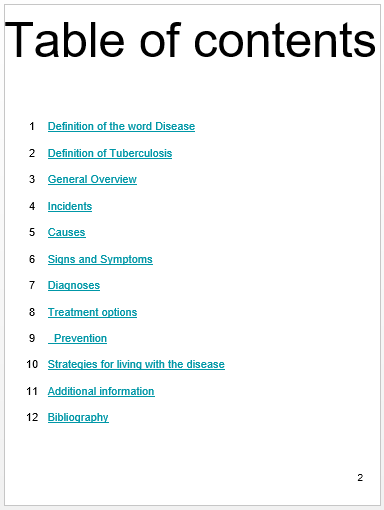 Last term I set my Grade 7 ICT class a task of creating a Natural Sciences e-book project on Diseases, in line with their class curriculum, using PowerPoint. 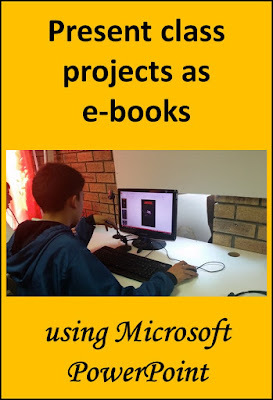 Read ‘Create an e-book project for your class using PowerPoint’. The class presented their projects as online e-books by uploading their PowerPoints to OneDrive so as to give them an online address. 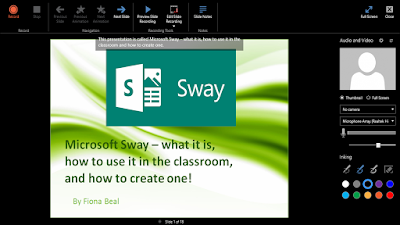 In today’s post we take the process one step further by adding video and sound to the e-books using the amazing PowerPoint add-in, Office Mix. Office Mix has its own online platform for providing web addresses to the e-books so we uploaded the presentations to this online platform. 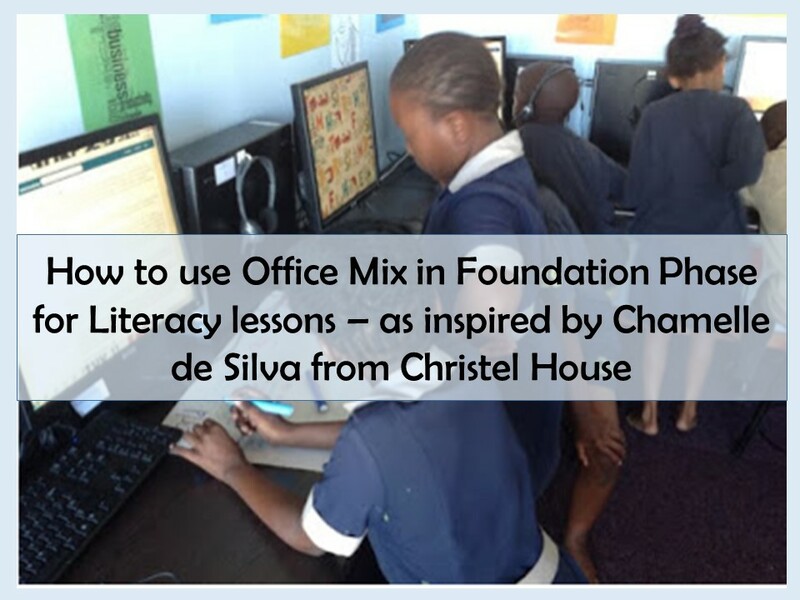 To read a detailed post on how to use Office Mix to take your presentations to the next level please read my post ‘How to use Office Mix in Foundation Phase for Literacy lessons – as inspired by Chamelle de Silva from Christel House’ This is how we went about uploading the completed Office Mix presentations complete with audio and sound (or just audio) to the Office Mix website. Step 3: Once in Office Mix, test your audio level before you start recording. Step 4: Make a slide recording using video slide by slide. Step 6: As you go you can add inking if you like. The final step will be uploading the mixes to Office Mix. You can use your own teacher account for this or each learner can create their own Microsoft account for their Mixes. (I opted to use my teacher account). Uploading to Mix using the Upload to Office Mix option publishes your Mix securely to your My Mixes page in the cloud on the Office Mix website. It converts your PowerPoint presentation (PPTX) file into a rich, interactive video with a unique URL. 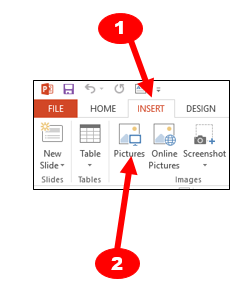 Click on Upload to Office Mix. A section will open on the right of the presentation with some options. I chose number 1 'Prepare' followed by Next at the bottom of the page. Once you are signed in you will be given some new options. I selected 'a new mix'and 'enable playback on a mobile device'. After that click on Next. Your Mix will start to upload slowly. When it is done it will give you the option to see the uploaded mix. Once on the Office Mix website under 'My Mixes'you will be given more options. Since I wanted to embed the Mix on this blog post I chose accordingly. 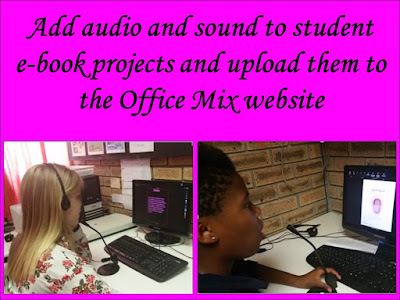 I am looking forward to using Office Mix again for a classroom project, and will improve on what I learned about this amazing application in the next round. If you haven't tried using Office Mix before please give it a try. . This post was inspired by a visit to one of Chamelle de Silva’s Grade R-4 learning support classes at Christel House in Cape Town. Chamelle does very exciting and interactive Literacy lessons with her learners in which they often use different types of technology. Chamelle finds that her younger learners particularly like working with PowerPoint 2013 in Literacy lessons. Learner creativity is exposed when they use the design and animation functions in PowerPoint. The learners also like to do the slide recordings in Office Mix with audio and video. When I saw how easily these young learners use Office Mix it inspired me to write this post. 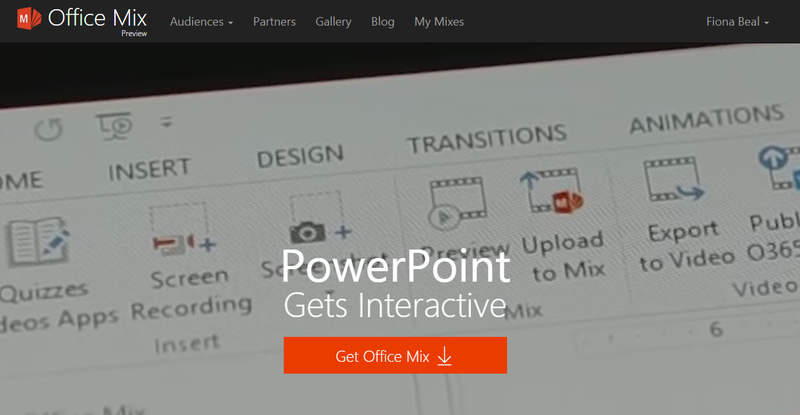 First let’s take a look at Office Mix and how to use it. At the end of all the explanations I will add three Mixes from Chamelle de Silva’s learners. 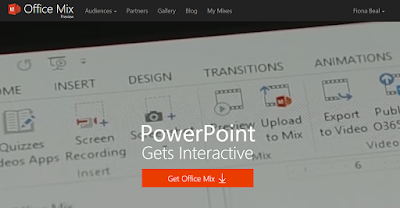 Office Mix is a free add-in for PowerPoint 2013. 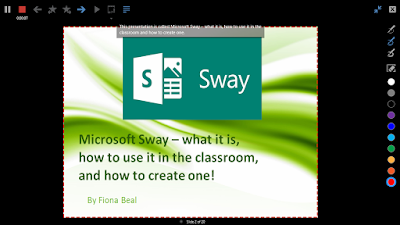 It is a powerful tool that makes the authoring and sharing of online lessons / presentations simple for both learners and teachers. It allows you to make the online lessons / presentations interactive with quizzes audio and video. It allows one to export lessons as mp4 videos. Here is an excellent example of an Office Mix from the Office Mix website gallery entitled ‘Photosynthesis Report (example of Office Mix for Students)’ . 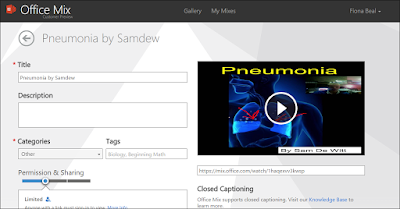 It explains what Office Mix is all about and how it can be used for a learner project. Learners can create documentary style reports and add whiteboardiing to explain concepts. They can also add polling to gauge and engage their audiences. Where do you locate Office Mix? 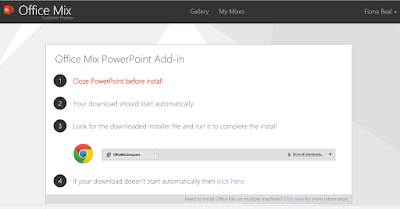 If you have PowerPoint 2013 installed all you have to do is go to https://mix.office.com and click on Get Office Mix! These are the steps we followed to give our PowerPoint e-books audio and sound using Office Mix. 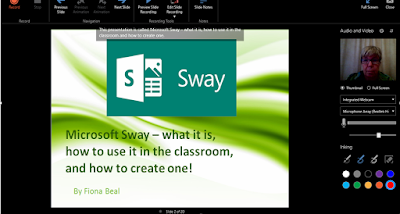 The easiest way to create a slide recording to upload to Office Mix is to create a PowerPoint presentation first. Then record on top of your existing slides. 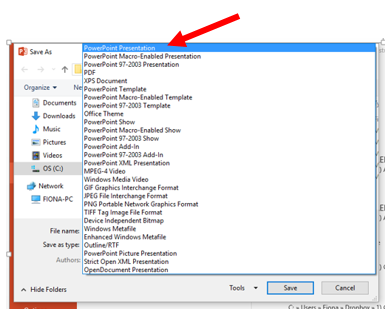 Make sure your PowerPoint is saved as a PPTX file. To do this choose ‘ Save as’ from the File menu and select ‘ PowerPoint Presentation’ (.pptx) in the Save as type drop down menu. Step 3: Test your audio level before you start recording. Click on Mix in the menu bar to get the Office Mix options. In the Audio and Video pane, select your microphone in the second drop-down list. On the slider below the volume indicator, drag the square left to lower the volume or right to increase it. Make sure you have added your notes in the notes section below your slide. This shows in Office Mix when you record but it fdoesn’t show on the final recording. If the sound quality is poor, use an external microphone instead of the mic built into your laptop. Even a headset will produce better quality audio than most built-in mics. As soon as you finish your first slide recording, play it back. Before you get too far down the road of creating your mix, you'll want to make sure your audio and video sound and look the way you expect. If the audio's too soft or too loud, or if the camera isn't positioned just right, click Delete Slide Recording. Then make adjustments before you re-record. Start recording slide by slide. If you make one slide recording per slide, then it's easy to re-record when you make a mistake. You can use inking as you go along to emphasis points. Click the pen (Fine Pen, Medium Pen, Thick Pen) you want to use to draw on your slide. After you begin inking, you can click the Eraser to remove all of your ink strokes. During the recording process your inking will look like this. 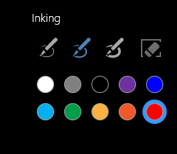 All the inking icons will appear one under the other. Make sure to save your work while you're creating your mix. If you decide to include a talking-headvideo, make sure to create good eye contact by speaking directly to the camera. Speak in aconversational tone so that your audience will feel like you're talking directly to them. But when you want them to focus on the slide content, forego the video and instead draw on your slides (i.e.,use inking) while talking. Note that you can use video and inking as you talk. If you want the video to appear as a thumbnail, click Thumbnail. This option creates a low-resolution recording. To fill the screen with your video, click Full Screen. This option creates a high-resolutionrecording. Select the camera you want use. If you’re recording on a laptop and you don’t have an external camera connected, select Integrated Camera in the drop-down list. Here is a summary of the control in Office Mix. Work through each slide and get your recording completed. Make sure to create good eye contact by speaking directly to the camera. Make sure it is saved. When you play Slideshow the whole presentation will run with the recordings playing. Delete and redo any slide recording you are not happy with. The final step will be uploading the mixes to Office Mix. You can use your own teacher account for this or each learner can create their own Microsoft account for their mixes. Uploading to Mix using the Upload to Office Mix option publishes your mix securely to your My Mixes page in the cloud on the Office Mix website. It converts your PowerPoint presentation (PPTX) file into a rich, interactive video with a unique URL. You can set permissions stipulating who can watch it, and you can also view analytics on usage, quizzes and polls. Let's get back to Chamelle DeSilvás examples from her learning support learners at Chistel House. a) The Help Guide found at the URL below is very helpful: http://www.mixforteachers.com/uploads/5/0/2/4/50241791/office_mix_help_guide_final.pdf. 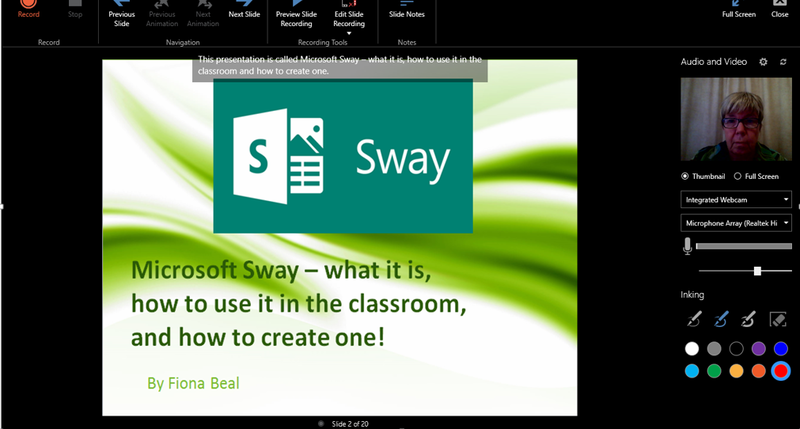 Did you know that PowerPoint can be used in a multitude of ways apart from it's original purpose of making slideshows. It is a great tool for creating e-books. This is part 1 of 'Presenting class projects as e-books'. This term I set my Grade 7 ICT class a task of creating a Natural Sciences project in line with their class curriculum and presenting it as an online e-book using PowerPoint. 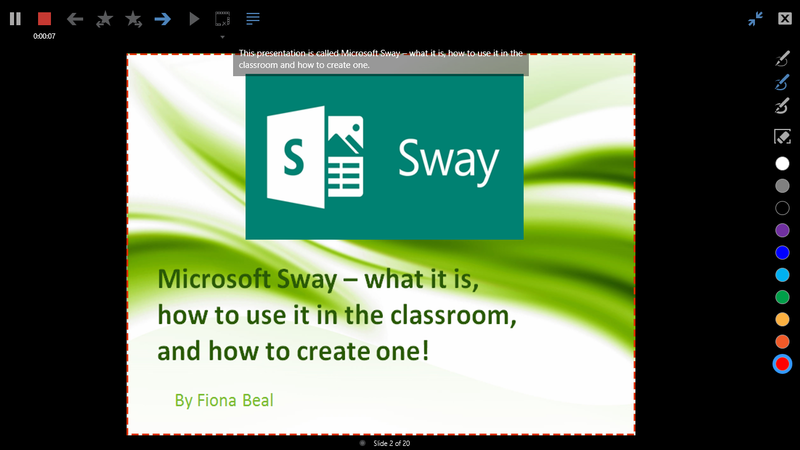 In the next post, in Part 2, we will look at adding video and sound to the e-book using the amazing PowerPoint add-in, Office Mix. 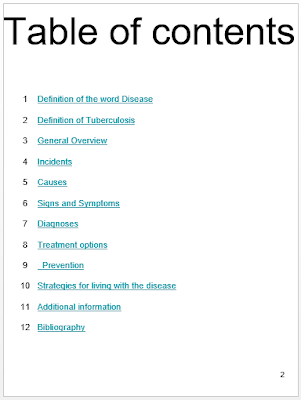 This task was carried out using research skills and Bing, and finding out as much as possible about one of the following diseases: Tuberculosis, Pneumonia, Diarrhoea, Malaria, Measles, Hepatitis B, Influenza, Yellow Fever, Diphtheria, Smallpox, or Black Death. The class was given a project outline to work from. 1. Title page – attractive - A4 format: Include full name, date, class and name of disease. c) What part of the body does it affect? d) How does the disease affect the body? a) How many people does this disease affect? b) Does it affect a certain age group? c) Does it affect a certain ethnic group? d) What is the Mortality Rate? 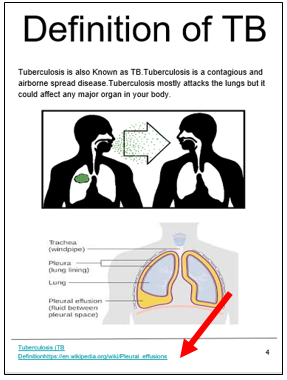 b) How is the disease transmitted? a) What tests do the doctors run to determine whether a person has the disease? b) Is there a cure? a) Are there any ways to prevent this disease? 12. Add any additional information that is useful and informative. We used PowerPoint for several reasons. The final project was to be presented on Office Mix which is a PowerPoint add-in that enables to PowerPoint to be shared with video and sound online. Another advantage of using PowerPoint is that it’s easy to manipulate images within the eBook and overlay images and text. Each slide can also contain a section or page of information in the final eBook to add to the book feel of the final presentation. 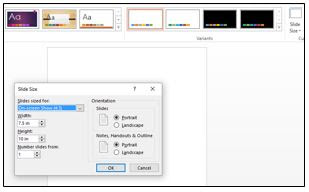 Open PowerPoint and choose your layout. Decide how you would like the eBook to look. We wanted ours to look like books. Go to the Design Menu, Click on ‘Slide Size’ on the right and make your choices. We selected the portrait slide orientation and changed the slide size to Custom 7.5 X 10 inch (my computer works in inches!). This part is optional to the size you would like to choose. In this section we learned about Creative Commons images and Public Domain images versus ‘any’ images. The best way to add an image is to save it on your computer and then use the snipping tool to get the portrait orientation. Insert the cover image by clicking on the ‘Picture’ option in the ‘Insert’ menu, and select the cover image where you saved it on your computer. The learners then overlay the cover image with their names and the title of the e-book. This feature is one of the plus points for using PowerPoint for making eBooks. This allows the reader to go anywhere in the presentation. Once you have created all your slides you will link each heading in the Table of Contents to a slide heading. The learners use the content they have recorded in Microsoft Word to create the content for their PowerPoint. They ensure that the font and font sizes are uniform throughout the eBook. I like the learners to draw a line at the bottom of each slide so that they can put links to the pages where they found their information even though the information has been synthesised into their own words. 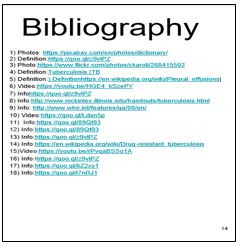 They also create the Bibliography for the last slide with the relevant links. This is how we did the Bibliography for this project. It appeared on the last slide. You’ll notice that all the hyperlinked lines of the eBook are now automatically underlined showing that they are active. 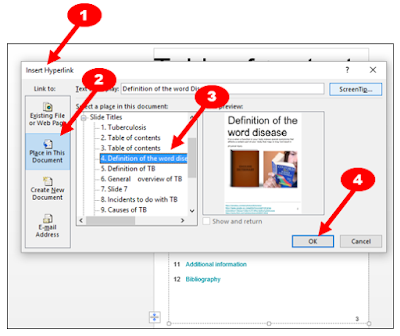 This is an embedded &amp;amp;amp;amp;amp;amp;lt;a target='_blank' href='https://office.com'&amp;amp;amp;amp;amp;amp;gt;Microsoft Office&amp;amp;amp;amp;amp;amp;lt;/a&amp;amp;amp;amp;amp;amp;gt; presentation, powered by &amp;amp;amp;amp;amp;amp;lt;a target='_blank' href='https://office.com/webapps'&amp;amp;amp;amp;amp;amp;gt;Office Online&amp;amp;amp;amp;amp;amp;lt;/a&amp;amp;amp;amp;amp;amp;gt;. 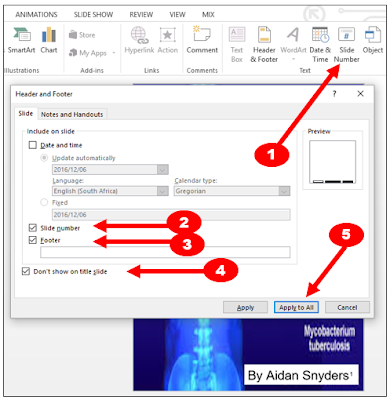 In the next post we'll show how to take PowerPoint one step further by opening the e-book in PowerPoint's add-in, Office Mix and adding audio and video.